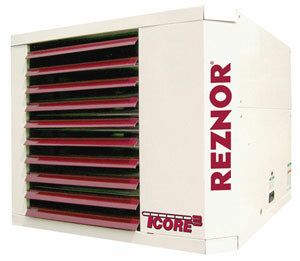 RADIANT HEATING | Wythe Sheet Metal, Inc.
Reznor? Series 100, Model B gas-fired gravity-vented unit heaters are designed for 80% thermal efficiency and are designed for use with natural or propane gas, as specified, in sizes from 25,000 to 400,000 BTUH input. Model B unit heaters are designed for ceiling suspension with a centrifugal blower for air delivery. Sizes 25-100 are equipped with a direct drive blower motor with multi-speed taps capable of handling up to .50″ w.c. of external static pressure. Sizes 125-400 are equipped with a blower using an adjustable belt drive and motor capable of handling external static pressure up to .25″ w.c. Optional motors and drives are available to increase the blower capability to handle up to .50″w.c. of external static pressure. Standard features on the Model B Series units include a manual match-lit pilot with 100% shutoff and a single-stage, 24-volt gas valve. A terminal strip connector facilitates field connection to a remote 24-volt thermostat for automatic operation. Each unit is provided with a fan control and all required limit safety controls, including an energy cutoff (ECO) device and a blocked vent switch. Radiant heat provides even, comfortable heat at every level and in every corner of your home. Heat is radiated throughout the space, practically eliminating cold spots and temperature fluctuations. A radiant heating system keeps floors warm and dry, making hard surface flooring more comfortable. Model VR tubular radiant heaters are available in BTUH inputs of 50,000 to 200,000 and in tube lengths from 20 to 70 feet (see the Technical Data table for BTUH/length combinations). All sizes are available for use with natural gas or optional propane gas. Model VR heaters provide full input rate heating capacity to 2,000 feet elevation. Tubular radiant heaters are engineered to provide quiet, reliable, energy-efficient, comfort level heating for both spot and space applications. Model VR is designed with a burner/control box housing a power burner that fires into a 4″ diameter tube, 20 to 70 feet in length. The burner is equipped with a blower for supplying combustion air and a multi-try direct ignition with 100% lockout. Controls include a single-stage gas valve and a pressure switch to verify combustion air flow.